In today’s business world, Information Technology is often a part of company’s strategic planning. This means IT directly affects business models, as it is not just used as a process enabler. The question often arises: How can a company stay on the cutting edge with the latest in IT technology? How can an organization then execute these technologies? Organizations have long battled the question whether they should hire a consultant or an end-to-end development team. Right now, with changing IT ecosystem, not only have technologies changed but so has the entire structure of the industry. More and more IT companies have built in-house 360° consulting capabilities to better understand their customer business. This technology provides assistance for the business goals and needs. It’s beneficial to stay aware of the latest industrial developments, to make informed decisions about an organization’s IT needs for all its Business Intelligence Solutions. IT development teams are themselves equipped to provide end-to-end services. This includes consulting, understanding the business needs and providing the solutions that is tailor-made for the business. In general, the industry has shifted in all sectors towards end-to-end teams rather than standalone consultants increasing overheads. The team works directly with the organization to understand the needs. The consultant on the other hand acts as a project manager who coordinates between the teams monitoring the progress of the project. With sophisticated tools and regular reporting structures, the entire process gets automated and transparent. With a project manager already existing from the development team’s end, this is nothing but a duplication of the role and increasing unnecessary expenditure attached with little or no extra value added. More than often it is better that the core IT team directly coordinates with the development team for a better understanding of what exactly is going on, giving them more control and removing an extra redundant layer of reporting and communication loss in the process. Even after the development project is over, having a consultant instead of directly interacting with the team would mean a constant dependency and a major chunk of important data that might never reach the organization’s core IT team simply because of the hierarchical information loss. One of the key roles of a consultant used to be to get involved in with the development team for bug detection and testing. Presently, with already formalized written test cases, regular regression testing, there is no more need of a consultant to redo the process. After every step, tests are conducted and bugs are detected starting in the very beginning. Depending on the size of the project, there are delivery managers and separate project managers to look into the execution. While the delivery managers manage his/her team for timely deliveries, the project managers conduct various meetings with the client firm, giving the demos, taking the feedback etc. With a consultant, it would often mean that he/she would take the feedback and hand it over to the third-party team executing the project adding an extra step. The IT teams presume that they will be handling the entire development and maintenance of the system in the long term. The experts from these teams help the organizations take long term decisions based on the existing structure. For example, this includes the kind of Database Management System and schema to be used looking into the business plan of the organization in future and equipping the system in a way that will sustain the operations and bring synergy. Consultants are rendered not of much use as the teams themselves with their expertise take decisions that are in sync with the long-term business goals. 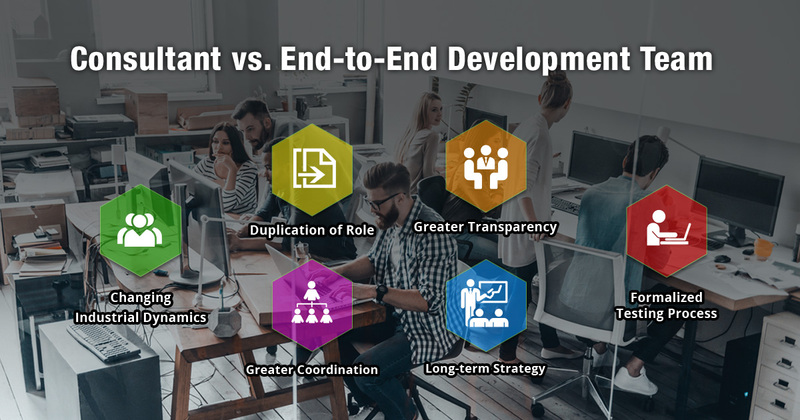 Call 484-892-5713 or Contact Us today to learn more about Consultant vs. End-to-End Development Team. There are so many technologies being released in the market! How can one be sure to use the best out there for his/her organization! That's where IT consultants kick in!